24 hours to go and still plenty to do …. If you have forgotten the cranberry sauce and live near Southborough, I still have a few jars. This is the cranberry and orange compôte I have mentioned before, flavoured with spices and port. It is the perfect match for your Christmas dinner and also to accompany the cold meats on Boxing Day. Happy Christmas to you all – have a wonderful time with your families and friends. One of our family Christmas traditions is the trip to Neals Yard in Borough Market to buy our selection of cheese . It started many years ago, going to the Covent Garden branch, queueing outside in all weathers to buy some Stilton and maybe a couple of other cheeses. In recent years, we have switched to Borough Market because a change in job meant a different location. My husband used to make the selection on his own but nowadays it’s a family outing, often with workmates and friends tagging along. 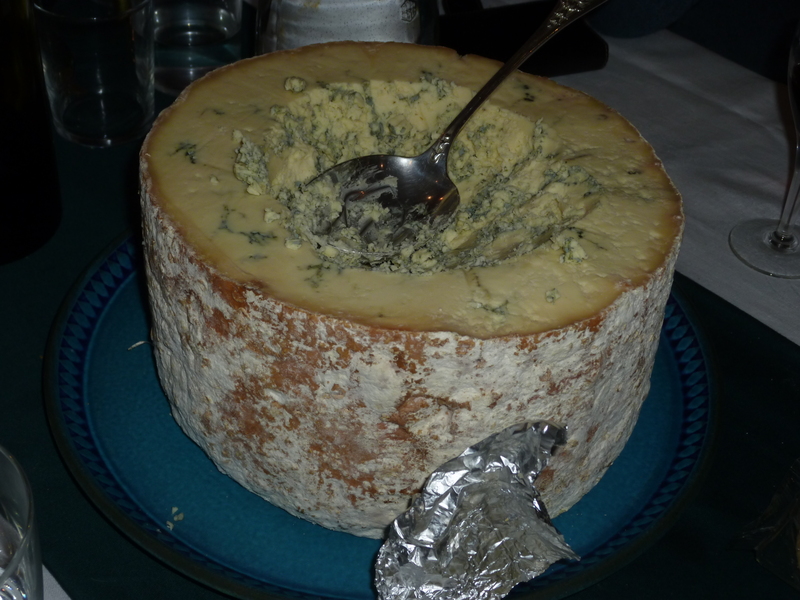 We always buy half a Stilton which is eaten over the following month. There are a couple of family favourites which have to made with the stilton – a broccoli and stilton soup and pear and stilton bake, which my grandfather first made for us more than 35 years ago. It is worth tasting the individual Stiltons as if they are too ripe before Christmas, they won’t last until the end of January. Other favourite cheeses include Cotherstone, Sparkenhoe Leicester, Applebys Cheshire, Hawes Wensleydale, Montgomerys Cheddar, Lincolnshire Poacher and Keens Cheddar. Soft cheeses like Innes Log are also excellent but we tend to favour the hard cheeses as they last longer. To accompany the cheese, try a Spiced Damson Chutney flavoured with allspice, ginger, cloves and cinnamon, and some Damson Cheese – which is like a thick fruit jelly and goes really well with all the hard cheeses mentioned. 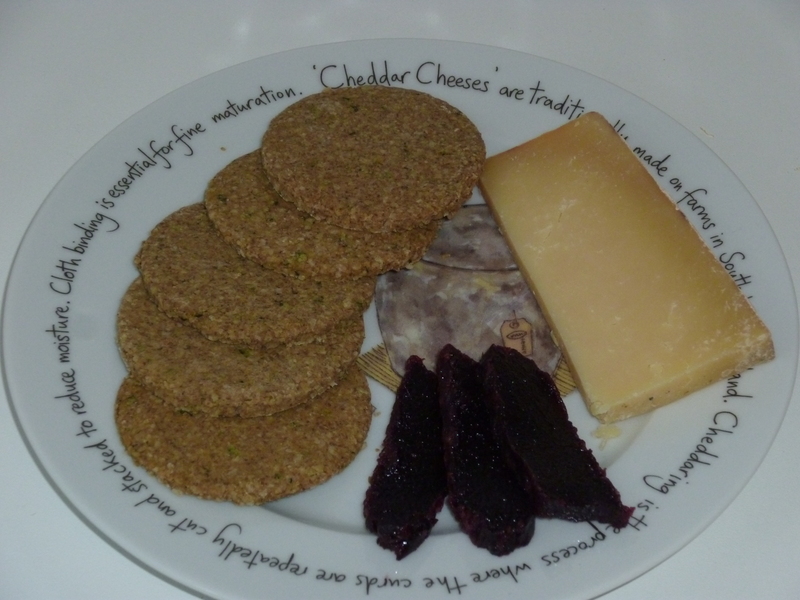 Homemade oatcakes with thyme complete this selection. All can be ordered ready for Christmas – these three items would cost £8.50. I am still taking orders for Christmas cakes and Panforte. All cakes and Panforte are baked to order so if you would like one, please contact me as soon as possible. 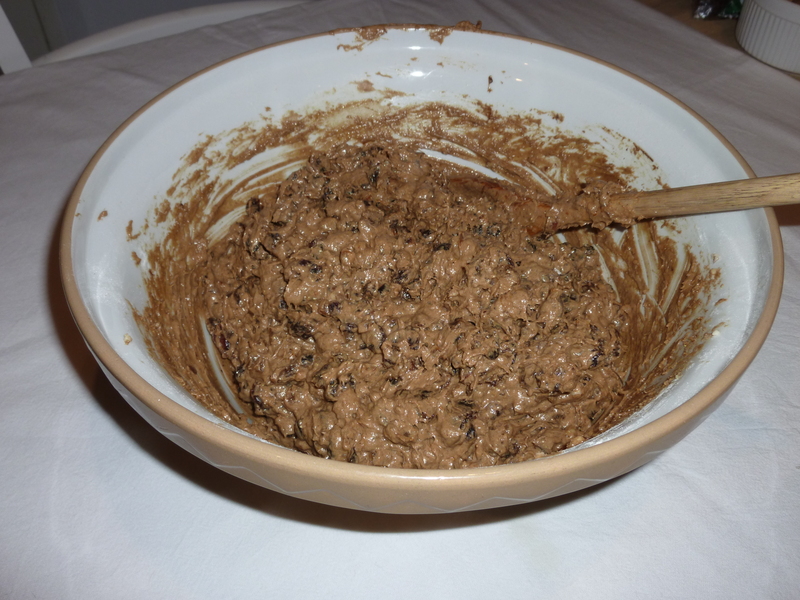 The Christmas cakes are made with butter, dark muscovado sugar, organic eggs and flour and a variety of dried fruits that have been soaked in brandy for at least 24 hours, as well as nuts and treacle. The spices used are cinnamon, ground cloves, nutmeg and mixed spices. The cakes will last well into the New Year and in fact I used this recipe for our wedding cake and we used a layer at the christening of our daughter 5 years after the cake was baked – it was however, re-iced! The Panforte are made with honey, soft brown sugar, dried figs and apricots, candied peel, walnuts, almonds, hazelnuts, ground almonds, flour, cinnamon, ground cloves and nutmeg. Last Saturday, I went to Frant Primary School to sell preserves and Christmas food gifts at their Christmas Fair. It was my first opportunity to sell to the general public so I was interested to see how it went. I had 2 chutneys, a jam and a marmalade open to taste as well as samples of Panforte and Christmas cake. It was good to get such positive feedback and I was delighted to sell several jars and cakes. 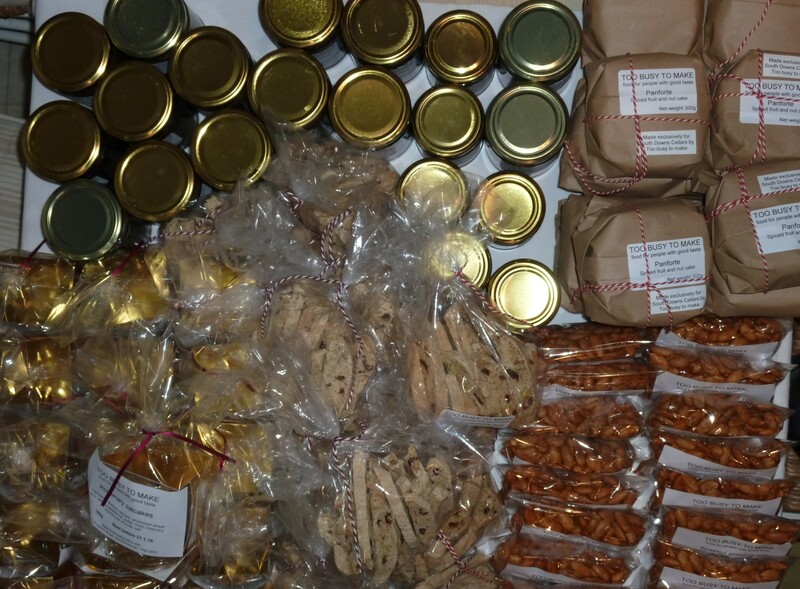 Then on Sunday, I delivered an order to http://www.southdownscellars.co.uk for their hampers – oatcakes, almonds, biscotti, Panforte, chutneys, mincemeat and compôte. I hope the food will be enjoyed with the excellent wines. There is still time to order a Christmas cake or a Panforte to enjoy at Christmas and I still have some jars of mincemeat if you want to make your own mince pies. Please email me at toobusytomake@btinternet.com with your requirements.